What are the sites of high-energy particle acceleration in the Universe? What are the mechanisms for cosmic particle accelerations? What role do accelerated particles play in feedback on star formation and galaxy evolution? What physical processes are at work close to neutron stars and black holes? What are the characteristics of relativistic jets, winds and explosions? How intense are radiation fields and magnetic fields in cosmic voids, and how do these evolve over cosmic time? What is the nature of dark matter? How is it distributed? Are there quantum gravitational affects on photon propagation? To learn more about how CTA will address these themes, click on the theme links above or continue reading below. Relativistic particles appear to play a major role in a very wide range of astrophysical systems, from supernova explosions to the galaxy cluster-scale outbursts active galactic nuclei (AGN). Within the interstellar medium of our own galaxy, these cosmic rays (CRs) are close to pressure equilibrium with turbulent motions of gas and magnetic fields, yet the relationship between these three components, and the overall impact on the star-formation process and the evolution of galaxies, is very poorly understood. CTA will provide the first real precision measurements of cosmic ray protons and nuclei (rather than the energetically sub-dominant electrons that produce the non-thermal emission seen at radio and X-ray wavelengths) in astrophysical systems, providing insights into the processes of acceleration, transport and the CR-mode feedback mechanisms in these systems. The primary goal of gamma-ray astrophysics thus far has been to establish in which cosmic sources particle acceleration takes place, and in particular, to establish the dominant contributors to the locally measured cosmic rays which are 99 percent protons and nuclei. Are supernova remnants the only major contributor to the galactic cosmic rays? Where in our galaxy are particles accelerated up to PeV energies? What are the sources of high-energy cosmic electrons? 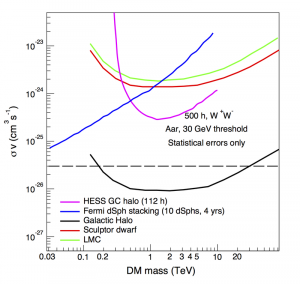 What are the sources of the ultra-high energy cosmic rays (UHECRs)? A census of particle acceleration in the universe with galactic and extragalactic surveys and deep observations of key nearby galaxies and clusters. Precision measurements of archetypal sources, where bright nearby sources will be targeted to provide resolved spectroscopy or very high statistics light curves to provide a deeper physical understanding of the processes at work in cosmic accelerators. Beyond the question of how and where particles are accelerated in the Universe, is the question of what role these particles play in the evolution of their host objects and how they are transported up to larger and larger scales. Above, simulated CTA images of the TeV-bright supernova remnant RX J1713 3946 for different emission scenarios. Source: Nakamori T. & et. al (2015). Prospects for CTA Observations of RX J1713.73946. Astroparticle Physics. 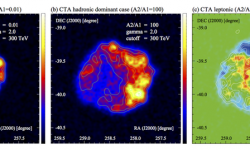 CTA will map extended emission around many gamma-ray sources and look for energy dependent morphology associated with diffusion (in the case of hadrons) or cooling (in the case of electrons). As the energy dependence is expected to be opposite in the two cases, such mapping provides another means to separate emission from these two populations. It is CTA’s unprecedented (in the gamma-ray domain) angular resolution, energy resolution and background rejection power that make this possible. Active galactic nuclei (AGN) are thought to harbour supermassive black holes (SMBH), accreting material and producing collimated relativistic outflows by a process that is still poorly understood. Similarly, accreting stellar mass black holes are known to produce jets, and particle acceleration seems to be universally associated with black hole-powered jets. Acceleration may occur in many places in these systems: from extremely close to the SMBH, up to where the largest AGN jets finally terminate. Active galaxies are likely sites for the acceleration of the ultra-high energy cosmic rays (with energies up to 1020eV), but, so far, there is no strong evidence for hadronic acceleration in AGN jets. Simultaneous broadband data is needed to study variable jet emission in both galactic and extragalactic systems. CTA data will play a key role by establishing the presence of VHE particles, identifying the presence of hadrons and probing extremely short timescale variability, probing the bulk ultra-relativistic motions of the inner jet. CTA will probe the environment around neutron stars via pulsed gamma-ray emission from the magnetosphere of pulsars and the ultra-relativistic outflows of these systems via mapping and spectral measurements of the associated synchrotron/IC nebula and (possibly and uniquely) the un-shocked pulsar wind. Because young and energetic pulsars cluster tightly along the galactic plane, the majority of objects will be covered by the CTA galactic plane survey. In particular, CTA will study two key objects: HESS J1825137 and the Vela pulsar (and associated Vela X nebulae). Binary systems, which include a pulsar, provide a unique opportunity to study a relativistic outflow under changing physical conditions as the orbit progresses, via energy-dependent light-curve measurements and combination with data from other wavebands (in particular the radio and X-ray). Merging neutron stars and other compact object mergers are the likely counterparts of short gamma-ray bursts (GRBs) and are expected to give rise to detectable gravitational wave (GW) transients in the near future. CTA will rapidly respond to triggers from GW and GRB instruments, to probe the highest-energy processes associated with such events. Much of the Universe consists of extremely under-dense regions known as cosmic voids. VHE photons interact within these voids and allow us to probe the radiation fields and magnetic fields that they contain. The extragalactic background light (EBL) is the integrated emission from stars and galaxies of all types through the evolution of the Universe. As such, it is an important tool for cosmology but is extremely difficult to measure directly, due to very strong foregrounds from the solar system and the Milky Way. However, the EBL leaves an imprint on the measured spectra of gamma-ray sources, via the process of gamma-gamma pair production. The wide-band, high-quality spectra measured with CTA, for a large number of objects, will allow the EBL spectrum from the optical to the far infrared to be very precisely measured. Furthermore, the evolution of the EBL with cosmic time can be probed for the first time. The pair-production of TeV photons in voids also offers the prospect of measuring the extremely weak magnetic fields thought to exist in these regions. The reach of CTA encompasses considerable discovery space in the area of fundamental physics. In particular, CTA will seek to discover the nature and properties of dark matter and probe the existence of axion-like particles and possible variations of Lorentz Invariance. Each of these effects would represent a very significant discovery. The major step in sensitivity and energy coverage that CTA represents brings such effects within reach and will undoubtedly lead to further discoveries in fundamental physics. Dark matter is thought to account for a large part of the total mass of the Universe, but its nature remains one of the greatest mysteries in science. There are numerous lines of evidence for the presence of an unknown form of gravitating matter that cannot be accounted for by the standard model of particle physics. The observation of the acoustic oscillations imprinted into the cosmic microwave background quantifies this dark component as making up about 27 percent of the total Universe energy budget. CTA will reach the expected thermal relic cross-section for self-annihilating dark matter for a wide range of dark matter masses, including those inaccessible to the Large Hadron Collider. The long travel times of gamma rays from extragalactic sources combined with their short wavelength make them a sensitive probe for energy-dependent variation of the speed of light due to quantum-gravity induced fluctuations of the metric. CTA will be sensitive to such effects on their expected characteristic scale: the Planck scale. Above, CTA sensitivity to a WIMP annihilation signature as a function of WIMP mass, for nominal parameters and for multiple CTA observations. The dashed horizontal line indicates the likely cross-section for a thermal relic WIMP. CTA’s detection of photons of energy extending up to hundreds of TeV from distant cosmic sources will make it a powerful tool to search for new physics beyond the Standard Model. Apart from the search for annihilation/decay signals from dark matter, there is the exciting possibility of detecting axion-like particles (ALPs) and finding evidence of Lorentz Invariance Violation associated with possible quantum gravity effects on space-time at the Planck scale. Blazars and gamma-ray bursts have been identified as the most promising (bright and distant) target classes for both these searches. On their long journey, gamma rays may couple to other light particles such as axions, under the influence of intergalactic magnetic fields. Such photon-axion oscillations effectively make the Universe more transparent to gamma rays, and, akin to neutrino oscillations, introduce a spectral modulation. Axions are a proposed solution to the strong-charge parity problem of quantum chromodynamics and also well motivated candidates to constitute a part or all of cold dark matter. ALPs are expected to convert into photons (and vice versa) as they traverse cosmic magnetic fields. In the case of a very distant active galactic nuclei, the ALP/photon coupling can result in a detectable enhancement of the TeV photon flux (which competes with the absorption on the EBL), dependent on the ALP mass. It has been suggested that quantum gravity effects may induce time delays between photons with different energies traveling over large distances, corresponding to a non-trivial refractive index of the vacuum. High statistics measurements of gamma ray bursts and blazars over a wide energy range will allow CTA to probe such effects with an order of magnitude better sensitivity than is possible with current instruments. Learn about the cosmic sources CTA will target in order to address these themes on the Key Targets page.